Last year I spent six weeks travelling through southern Burma, working my way from Yangon to Kawthoung as I researched a new guidebook. 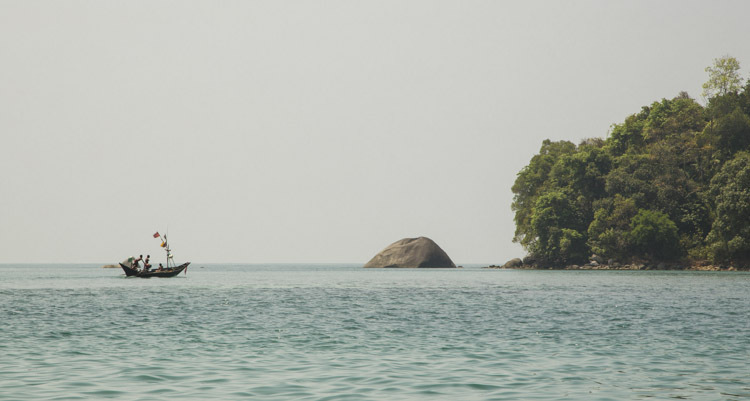 Sitting at the southern end of Burma’s slender panhandle, at the end of a long coast of plantation-covered hills, mangrove-fringed islands and empty beaches, Kawthoung is the last stop in Burma before you hit southern Thailand. 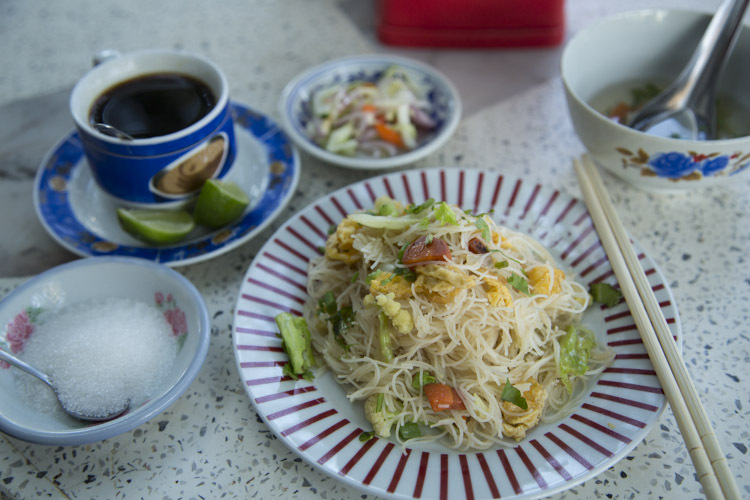 Noodle salad, pickles and clear soup with a cup of sweet, lime-spiked Burmese coffee. As a rule, I don’t take pictures of my food when I eat out, but the flavours of this particular meal were so fresh and good that I suddenly felt the need to. I’ve wanted to recreate this meal since I got home, and finally got around to it late last week, with very satisfying results. I’ve yet to tackle the soup, but the meal works fine without it at any time of day. Instructions for how to make the pickles and coffee are show in Cook’s Notes under the main recipe below. 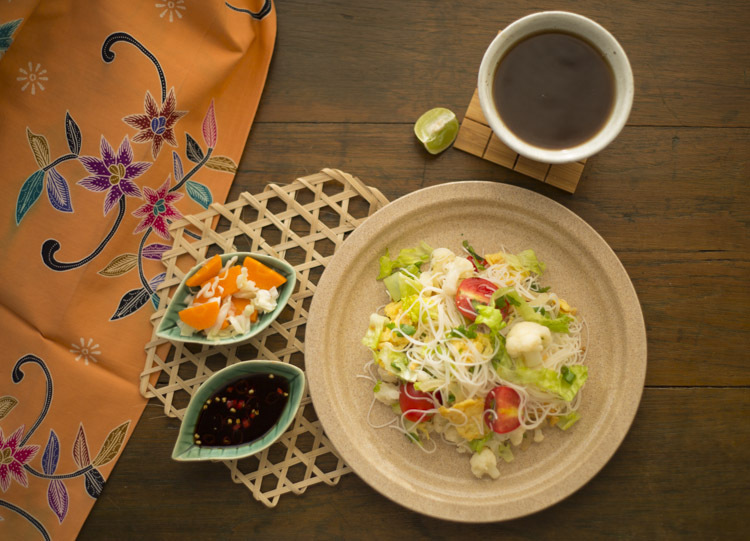 Cauliflower makes an appearance in this dish, which is fairly unusual in the context of South-East Asian food. (Does anyone know of cauliflower dishes from the region? I’d be interested to try some…) But if you think about Burma’s proximity to the Indian subcontinent, home of Aloo Gobi, then it suddenly makes sense. 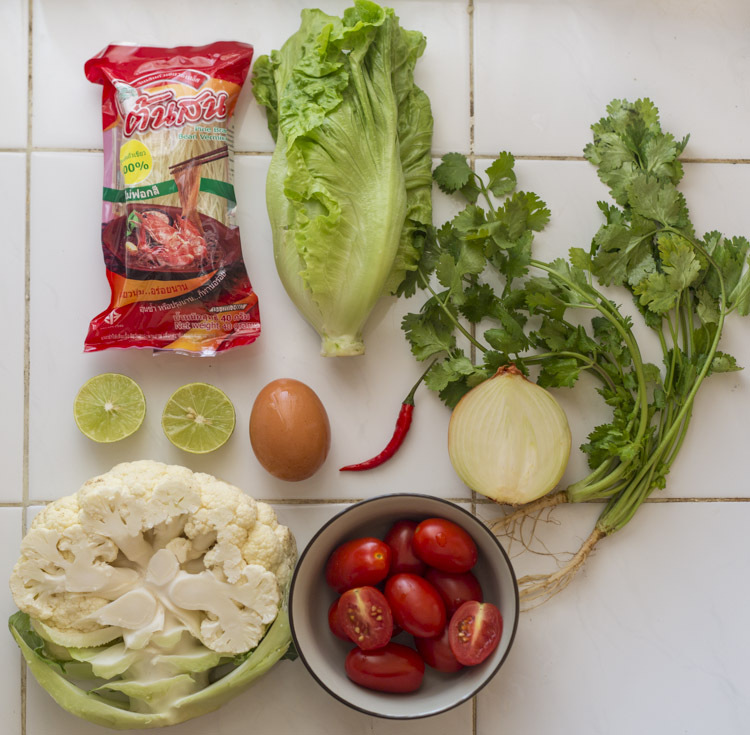 Cauliflower florets pop up in restaurants all over Burma, along with samusa thouq (samosa salad), crispy chickpea fritters, falooda and other delicious Burmese riffs on Subcontinental flavours. [Licks lips] Anyone else hungry after that? 1. Soak the vermicelli in cold water for 8-10 minutes, then drain. While you’re waiting, boil a saucepan of water and break down the cauliflower florets into smaller chunks, as shown in the photo below. Add the drained vermicelli and cauliflower to the water, giving them 90 second or so to blanch and cook through. Drain well and toss into a mixing bowl, working a little oil through the noodles to stop them from clumping. 2. 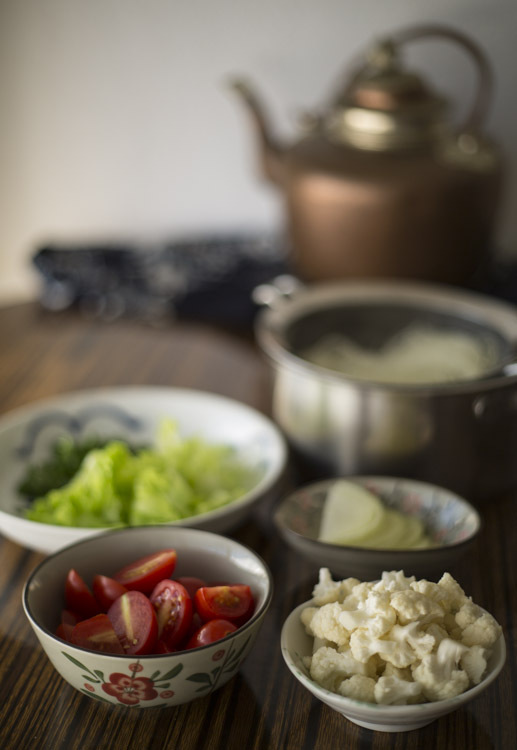 Prepare the remainder of the vegetables – slice the cherry tomatoes in half, roughly chop the lettuce and coriander, thinly slice the onions – setting the onions aside and adding everything else directly to the mixing bowl. Add lime juice and salt to taste. 3. Heat a little oil in a frying pan over a medium-high flame. While this is heating, beat the egg with two good pinches of salt, then fry until golden on both sides. Roughly chop the omelette into bite-sized pieces with your spatula. Add these to the mixing bowl. Saute the onions briefly and add to the bowl too. Mix, check the seasoning and you’re done! To make overnight pickles, mix chopped cabbage and carrot with just enough rice vinegar to moisten them, plus a little salt and a pinch or two of sugar. Refrigerate overnight. To make Burmese coffee, add a heaped teaspoon of coffee powder (I used Indonesian Kopi Bubuk – coffee powder – but instant coffee would work too, no need for anything fancier) to a mug of hot water, add a spoon or two of sugar, a squeeze of lime juice and stir. That looks beautiful! I’m going to make this for dinner next week. I went to Mergui islands many years ago from Kawthoung and we dinner in this little town finding a very good food, it’s a pleasure remember this… Thanks! I really enjoy traveling with you and the artistic presentation of food and scapes is wonderful. Gives me a moment to step outside my day.